The Liebfrauenberg in Frankfurt is the second largest square in the old town after the Römerburg and considered one of the most beautiful places of the city. By 1416 it was already paved and from 1490 a cattle market was held here. At the end of the 15th century a fountain was erected in the square. 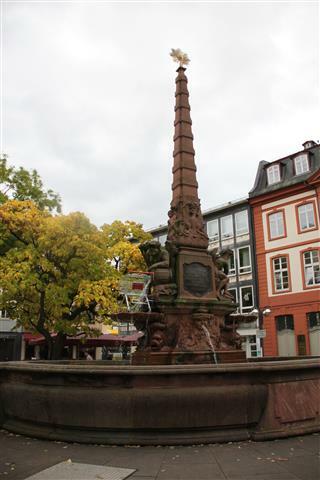 A siege plan of 1552 indicates that circular wells were built and a fountain, already referred to with the same “Liebfrauenberg ” name as the square, was present to supply residents of nearby houses with water. In 1573 there was a failed attempt to establish a fair for merchants and to build exhibition stands in the Liebfrauenberg. It failed due to lack of demand but the place continued to remain a central and very popular place for the comings and goings of urban life. 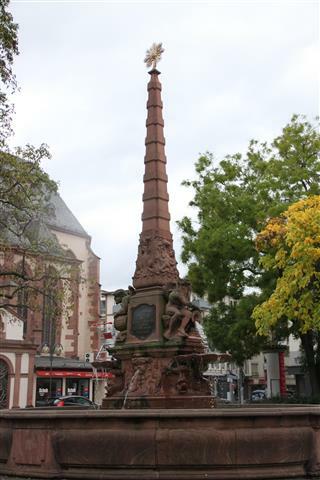 The well in the Liebfrauenberg was remodelled in 1594 into a fountain, but by 1769 the fountain needed to be demolished due to disrepair and was rebuilt in 1770 by sculptor Johann Michael Datzerat according to a plan by city architect Johann Andreas Liebhardt (1713-1788) in the late Baroque style. 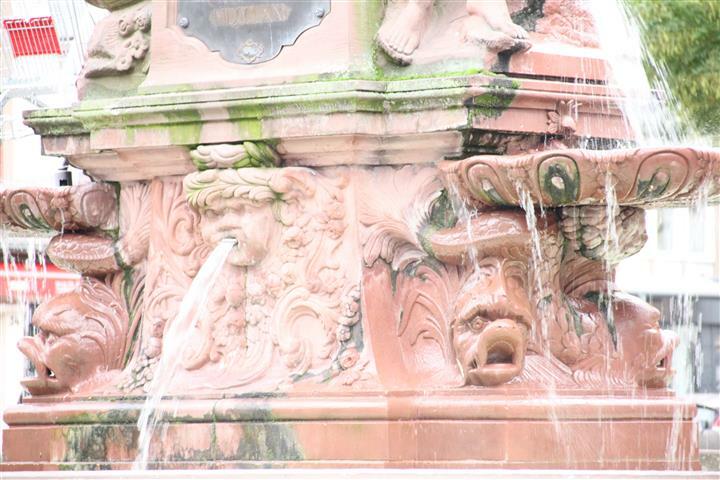 The resulting fountain consists of a large oval fountain basin with beaded, curved rim parapet, in the centre of which stands a square fountain and an obelisk with baroque decorative elements. Bronze plaques are embedded in the sides dedicated to the river gods figures of Moenus and Rhenus (Main and Rhine). Water flows from pitchers into the expansive pools in the shape of shells, that rest on the crossed bodies of dolphins. The originals of the river god figurines Moenus and Rhenus are located in the park of the Liebieghaus. From the shell basin, the water flows down into the actual fountain basin. From the mouths of the dolphins additional water flows in a directly into the pool. The Frankfurt city coat of arms adorns the front of the column and the tip of the obelisk features a gilded sun. The Liebfrauenberg is located in the center of the northern Old Town. Dominated by the Gothic “Liebfrauenkirche” (Church of Our Lady) and close to the Kleinmarkthalle (indoor food market) it’s biggest feature is the Liebfrauenberg fountain with it’s high obelisk column and sculptural elements. During the Second World War, the fountain was protected by a sturdy wooden frame designed to preserve the sculptures from destruction. The upper part of the obelisk and the fountain remained without cover and thus unprotected, and were fortunately miraculously spared by the bombs in the air raids that rained down on Frankfurt am Main. In the 1960’s and 1970, the well, figures and column showed serious signs of deterioration so were copied by the sculptor Kurt Zobel and rebuilt. 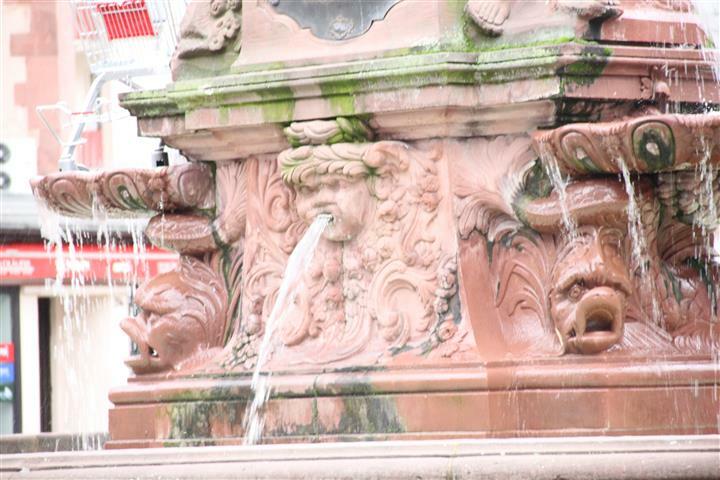 Since July 1973, the city council reintroduced and maintains the well and the flow of water in the fountain. In the warmer months a flower market takes place at the Liebfrauenberg, during Advent, the entire historic area caters to a large Christmas Market that runs all the way from the Liebfrauenberg to the Römerberg. 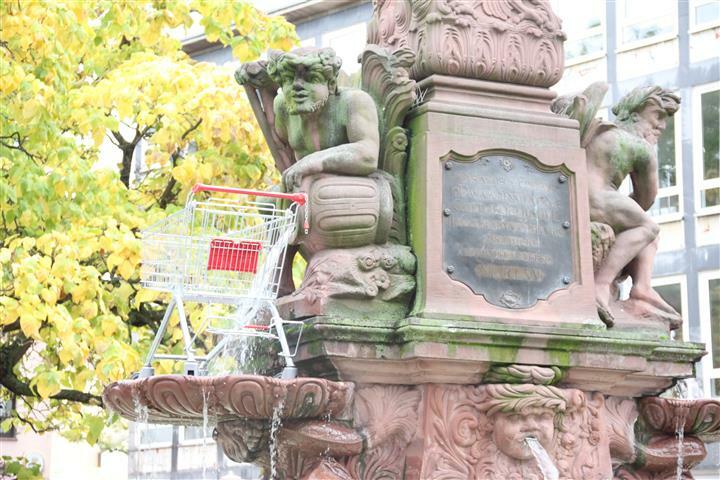 When we visited, the fountain sported an additional adornment: a supermarket shopping trolley, probably as the result of some drunken student prank. I also did something wrong with the settings on my camera and some of the photos came out looking overexposed. Still, some detail is better than none, right?